Well, the date I consider my One Year Blogging Anniversary came and went yesterday and I didn't even get on the computer. Not much at least. I've been mulling over what 2013 will bring and wondering what paths I need to head down. 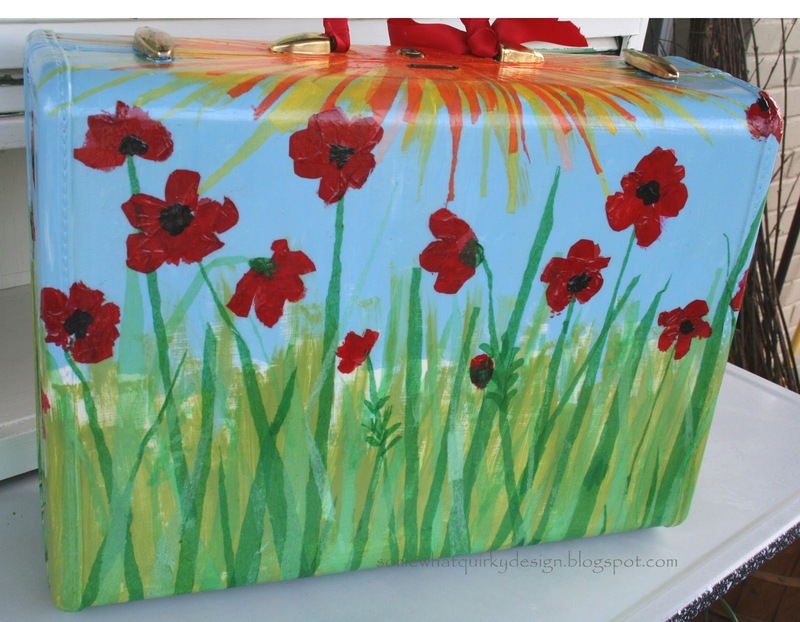 There are long lists in my mind of things to do for the blog, for my home, for my family, etc etc etc. But if I've learned anything this last year it is that putting a goal on my blog is death to the goal. But that's not entirely a bad thing. Usually what happens is that I write out something I'm going to do - as in these promises about my kitchen - and then I do absolutely nothing toward that goal. HOWEVER, these promises do seem to drive me into the exact opposite direction and I get some other wonderful thing done - like this, and this, and this. 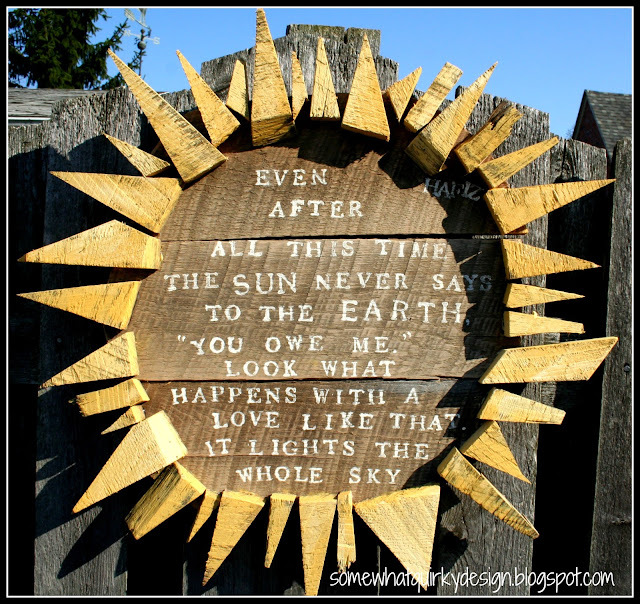 Winning my Heart to Heart award is this sun that I whipped up one afternoon last spring. I say heart to heart because this quote spoke to my heart and yours. When I say threw together I mean it. I have had to remake this several times because I didn't use the proper glue. I didn't seal it either so I will probably have to do some major touch-up on the rays this spring. I have to make one for my sister this year so I get a second chance to make it right. This one has instructions for redoing the lining on these old suitcases. The Maybe If You Make It Twice You Can Get It Right award goes to - It Is Well. Go here to make it, then go here to make it right! It was worth it to make this twice. Fortunately it was really simple. The Most Loved award goes to my Pink Doughnut Pillow. Not most loved by me. Not most loved by you. Most loved by 20+ little first graders who covet their time sitting with the doughnut pillow in the reading nook in my sisters classroom. There are funny stories about this pillow and I will be making another one for them to use next year which I will post at a later date. Oh yes, the above link is for the tutorial. Click here for her glamor shots. They are really special. The award for Quality Of Life Enhancement goes to my vintage ceiling tile backspashes. I love them. They make me smile when I wash dishes and when I cook. Well, it looks like there are five. Which one is your favorite? There are probably more, but I need to get on with my day. Hope you guys are recovering from your holidays and well into your plans for 2013. I feel the dark cloud of a basement cleaning month week hovering over me. I would probably ignore it, but I really need to get some work done and there is no "getting work done" space available. Damn. 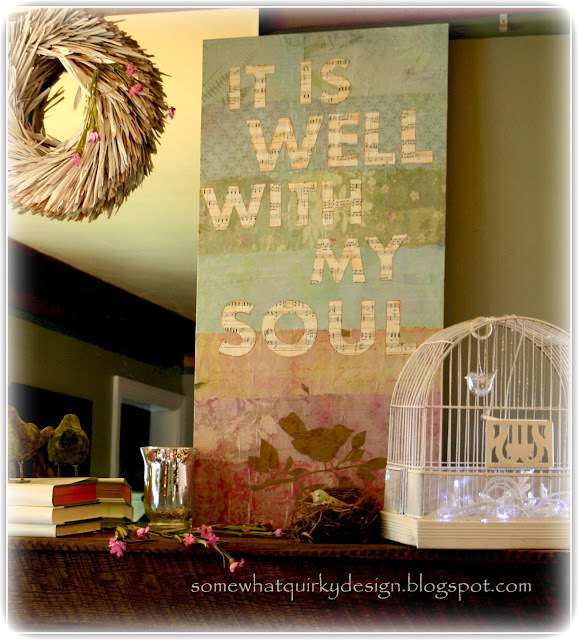 I like the "soul" sign, just because that's the way I am. I never saw the sun sign. That was adorable. They were all great projects. P.S. 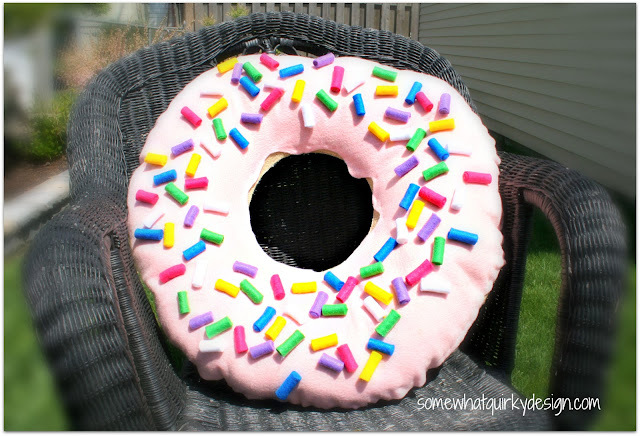 Who wouldn't break a smile at the donut pillow? Doughnut pillow! Just pinned it! Wonderful projects. I love the sun. The tin is still awesome! 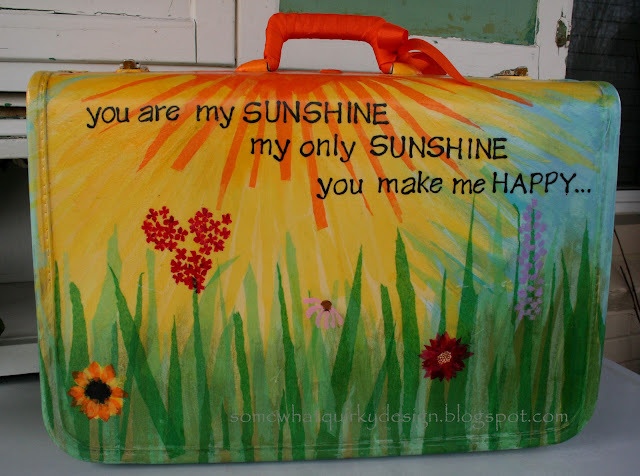 I choose the sun! I wanted to stop by and say that I am so excited to get to meet you at Haven this year! My favorite has to be that sun! I love that it's scrap wood, and the saying is just perfect! But I'm still stuck on your pine cone trees too, LOVE those! Painted tin tiles always make my heart skip a beat and I love signs...but that donut pillow is the cutest! Those kids must think it's the best thing ever! I'm a new follower...anyone that cracks themself up is a friend of mine. Oh, Karen, I am loving so much. 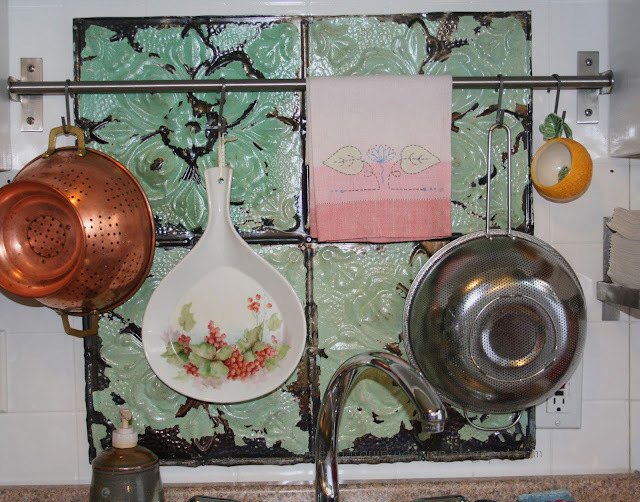 I first discovered my love for your backsplash tiles when I originally found your blog. The donut pillow is amazing and I can just imagine being a school kid dying to be in the reading chair just to get to be with that pillow. What a great idea. With that you could singlehandedly raise the literacy rate of the nation's children. I LOVE the It Is Well picture. So cool. Yep, it's good to miss goals if you end up with other things that are amazing. Sometimes the good stuff is on purpose, sometimes it's rebellion from what we have to do. But look at all you've accomplished. Bravo! All five of your projects are adorable. The sun is my favorite...I'm a big fan of that quote and you really created something cool with it. My son would go nuts over the donut pillow. He can't get enough donuts. (probably because we don't get them for him often, lol) but he even wrote a paper about wanting to work in a donut shop when he's old enough to work...just so he can get free donuts!